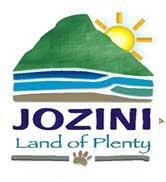 The Jozini Municipality is located in Northern KwaZulu-Natal and borders Swaziland and Mozambique. The Lebombo Mountains and Makhatini Flats provide a diverse and beautiful terrain, which is rich in local resources, including water features and even fossil sites. Both Ndumu and Mkuzi Game Reserves can be found straddling the borders of the Jozini Municipality. Significant portions of Jozini have been neglected in terms of economic development. There is a great disparity between the level of service and infrastructure provision between settlement nodes, such as the towns of Mkuze and Jozini, and the surrounding rural areas. Most of the rural area is associated with a lack of development, poverty and poor service provision. Jozini is the access point for Northern Maputaland. It is a small business centre situated close to the impressive Pongolapoort Dam, better known as the Jozini Dam, one of the largest in South Africa. This dam is designed to irrigate more than 80 000 hectares of agricultural land supporting products such as sugar cane, rice, coffee, cotton, fibre crops and various sub-tropical fruits. The dam draws its water from the Pongolo River, which means '' trough'' and is the principal river of Maputaland. The Pongola River, in its path to the sea has given birth to a series of oxbow lakes and pans that are teeming with fish and bird life. Supporting a massive population of fish, crocodiles and hippos, as well as the people of the area, it is an integral part of the economy of the region. Each year the spreading waters of the Pongola River replenish these pans as it floods its banks after the summer rains. The floodplain tract is about 70 km long and between half and one km wide. It is necessary to institutionalise the tourism industry by promoting partnership investments. The Jozini Dam is an under-exploited resource in the area. The local municipality has identified the need for park and recreational zones at Jozini to boost the local economy through tourism. The Muzi Lake, boat and canoeing projects have been specified as a priority project represents a potential entry point to unlock potential.. Possible development partners include KZN Tourism, the Department of Economic Development and Tourism (DEDT) and the KZN Department of Agriculture and Environmental Affairs. Lebombo Mountains; Pongolapoort Dam (commonly known as Jozini Dam); Pongolapoort Game Reserve; Mkuzi Game Reserve; Ndumu Game Reserve; Hlatikulu Forest; Jozini Dam Development; Border Cave; fishing in the Pongolo River; King Dingaans Grave; Usuthu Gorge. To improve the quality of life, in an environmentally sustainable manner, of all residents through the provision of: adequate and appropriate infrastructure; employment and investment opportunities; social empowerment.